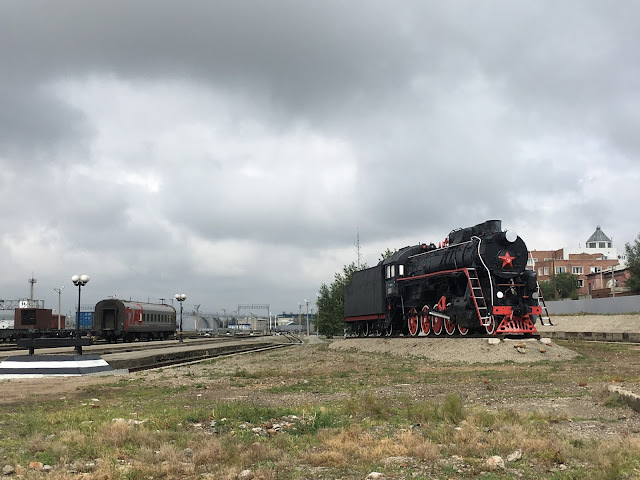 Those who started their research with seat61.com would know that there are multiple Trans-Siberian trains leaving at different times of the week taking different routes. Had timing allowed, I would have liked to take the Trans-Mongolian train passing through Gobi desert, which my brother described as breath-taking at sunset. 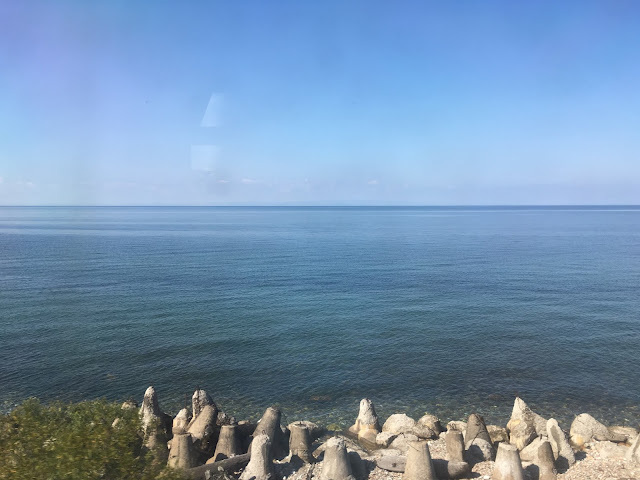 The twice-weekly train timetable didn’t work for me; I could only stretch a 3-week break before starting work in London, wanted to spend a couple of days in Beijing, ample time in Lake Baikan and a a few days in Poland before coming home. Trans-Manchuria leaves Beijing every Saturday at 11pm - this works! I can at least tell my brother what he (hadn’t) missed. I shared a 2-bed berth with a Chinese lady that spoke fluent German and Russian as she was teaching Chinese in Ukraine for 8 years before moving to Germany. She is scared of flying and so trains are her major mode of international transport. She used to be a regular for their train ride, and was basically everyone’s translator. Interestingly she didn’t speak any English, forcing me to practice my Mandarin. Bless she was ever so patient. Unlike the Trans-Mongolian, this is a Russian train with Russian attendants who do not speak any English, so without her there would be even more guess-work. I heard the Chinese trains may not be as clean but the atmosphere is usually friendlier where the restaurant staff may sometimes offer free food to Chinese passengers… not sure about that. The train was luxurious. The compartments were incredibly clean. I even had a TV! Not that I ever switched it on - it’s just unnecessary noise. The toilets were located at the end of each carriage, sockets along the corridor and also free hot water. Given my last long train journey was in India, and before that Vietnam, this train was pretty damn badass. The train left relatively promptly around 11:10pm, and I got to set up my little area and make myself comfortable. For the first next, I slept like a baby; asleep before midnight and woke at 10:30am. If it hadn’t been getting colder, I think I could have carried on. My brother was right, the aircon kicked in overnight and I needed to put on a light jacket. The scenery was mostly green fields and industrial towns as we passed through Chinese settlements. I passed time with a bit of writing, a bit of photo-sorting and mostly chatting with other passengers - picking up some Russian and Mandarin. The train attendant came round with our passport and asked for 20 yuan, apparently for immigration at the borders, regardless whether you needed a visa. Actually they were just trying to charge you for completing the immigration form for you, which they have already done. I only had 18 yuan to my name… Thankfully my fellow travellers helped me out. The first day went by so quickly, possibly because I had quite a lot of writing to get through, and also slept a lot. At 4am, I was woken up as we arrived at Manzhouli Station, the Chinese border. Chinese officials came onboard to check our passports. I overheard the attendant saying to another Chinese lady that she had to pay 50 yuan instead of 20 because she completed the immigration form incorrectly. The Chinese lady explained she couldn’t understand her in the first place and that’s why she’d had to complete the form herself… not sure how that ended. I had a feeling the Russian peeps were just trying to make a few bucks for themselves, and it would have been completely fine if one didn't pay. It's just their distressed angry looks and language that made people quite nervous. We stayed in Manzhouli for just under 3 hours. Once we got our passports back from the Chinese officials, we were allowed to get off the train to stretch our legs and pick up food. Not that I could afford anything on the Chinese side. Then the train moved again and arrived at the Russian border Zabaikal’sk. This is where you need to move your watch back 5 hours. The train tracks in Russia is narrower than the ones in China, and so the train had to switch their wheels at this station. Similarly the officials came onboard to check our passport and searched through carriages, then we had about 5 hours to kill, except we had to get off the train this time. The station is pretty small, but thankfully there was a cash machine so I didn’t have to walk around ruble-less. The town was a little depressing to be honest, most of the buildings were pretty run down. There was a minimart about 100m from the station, a little red building to the right hand side once you reached the main road parallel to the tracks. Things were cheap. Timing is interesting here. The train goes by Moscow timezone but each individual town that the train runs through has their own local time. I decided to stick to Irkutsk time to help my biological clock. The train stops for 25 minutes at Ulan-Ude. The town is the first proper town we arrived at in daylight since crossing the border, plenty of shops and cafes open for stocking up. I sneaked off to check out the church just behind the station. 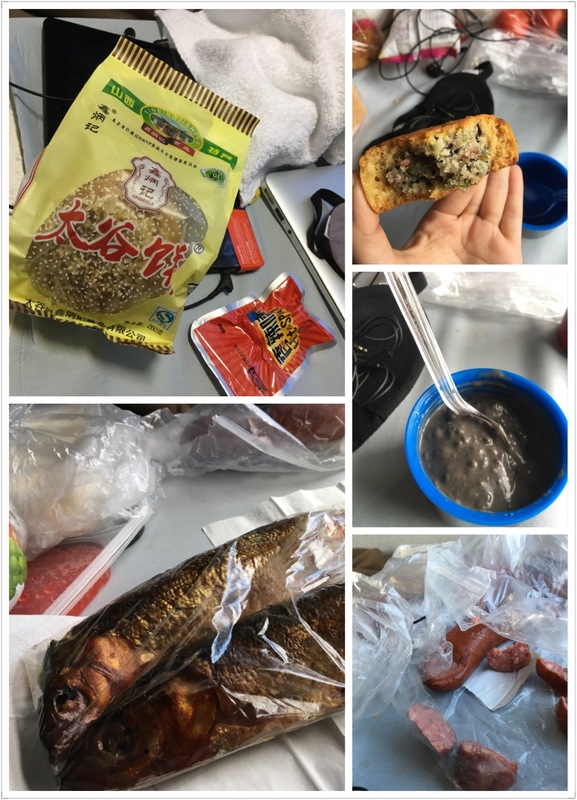 I was offered all kinds of foods from the Northern province of China throughout the journey: spicy duck neck, Shan’xi biscuits, northern mooncake and even black sesame soup. The travellers were keen to buy all sorts of things from the Russian shops, and then pass them around for sharing. Half the stuff they bought they end up giving them away though, not suited for their palate I suppose. My berth companion was kind enough to buy me a Russian roast fish to try. It was delicious! 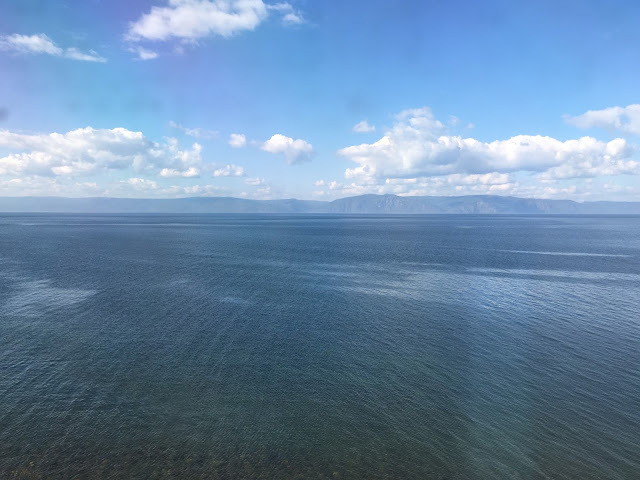 About an hour after leaving Ulan-Ude, the train began its route along the southern coast of Lake Baikal. The view was simply breath-taking; 3 hours flew by as we were mesmerised by the vast clear waters. I’m so glad I decided to make a special trip to the lake instead of just cruising pass it. Finally arrived at Irkutsk about 10mins ahead of schedule, 6:30pm local time. After waving my wonderful train-mates goodbye, I set off to arrange my Olkhon Island transport before it gets dark.